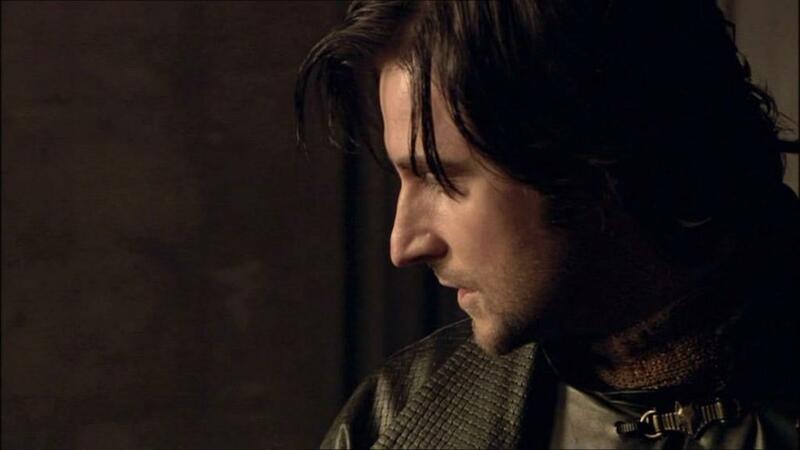 Today’s images of Richard Armitage as Sir Guy of Gisborne were provided by trlibhart. One of trlibhart’s choices is below and another is on the calendar. The above screencap comes from Robin Hood season 1 episode 13. Wow he looks great here. The poll from yesterday clearly indicates that season 2 Guy is the favorite. However, I chose season 1 Guy. I based my decision solely on his looks because I am shallow. 😉 Three times in a row, my choices were dead last. Maybe I should award myself a prize, LOL! I’ll be back within the week. I can’t stay away long or I’ll miss you too much. Feel free to contact me with ideas. If I get a lot of requests for the same thing, I often find a way to include it on my blog. This entry was posted in Calendar, Fan Videos, Graphics, Poll, Polls, richard armitage and tagged actor, calendar, guy of gisborne, richard armitage, richardarmitagenet, richardarmitagenet.com, richardarmitagenetdotcom, robin hood. Bookmark the permalink. 86 Responses to Happy New Year! Happy New Year to you too and thanks for all the fun! I think that you attached yesterday’s calendar to today’s post. @Kathleen: You’re so right and I’m so wrong, LOL! I have since corrected the post to the correct calendar. Happy New Year! Looks great and I finally found one of your surprises! Have a great new year. @Kathleen: Delighted you found the fireworks, woohoo! 🙂 Hope it’s a glorious 2012. @CDoart: Hope you come back because the calendar is fixed, woohoo! Happy New Year! @CDoart: Yay, I’m glad you came back. I’m glad I came back to check and see that I had posted the wrong calendar page, LOL! 2) screencap by trlibhart is great! 5) Happy New Year BCC! Lucas gets a day of the week in RAFN–Lucas/Kruger Tuesday. So, hang on a few more days. I’m with you Carla! More Lucas in 2012! Lucas fans unite! @Carla: I fixed the calendar to the correct day. 🙂 Hope you can find the surprise! A Lucas event sounds like a good idea. Happy New Year! Yup! We’re all still eagerly anticipating the Dec. 31st calendar page, pretty please with sugar on top. Ha! It has been a wonderful couple of months with your October through December RA activities! Hoping that you have a wonderful and restful trip! See you in the New Year! @judiang: Thanks very much and Happy New Year!!! Bravo! and this wonderful calendar! And I’m right there with you on Season 1 Guy. That look is my favorite. @RAFrenzy: Yeah, we are in last place, LOL! Happy New Year! I can’t see it either. She said stamping her foot. : D No, seriously, I can only see up to December 30th. Maybe I’m doing something wrong. It helps to read the whole post! LOL!!! @Holliday: The surprise is now posted! Happy New Year! @Emma: I visit RichardArmitageNet.Com each and every day. It’s my favorite of the many fine Richard Armitage fan sites because it’s so up-to-date and they have graphics and puzzles and polls and lots of interactivity. 🙂 I’m delighted you found us! Happy New Year! @jules: Thanks for your lovely (and funny) sentiments! I agree about those giant teacups. What was up with that? They looked like chamber pots. Lucas North and John Thornton will have their turns in the coming year, I’m sure. And who knows? Maybe we’ll have a surprise before The Hobbit hits theaters! Harry Kennedy was my first Richard Armitage character too. ♥ So cute and happy and I actually liked the stripey sweaters! @Monica: Yay for shallowness. We are a happy bunch, aren’t we? LOL! I wish you a wonderful New Year too! Great chose Trlilibhart ! I love Guy in the S 1 too. I also would like to suggest a Lucas calendar. He´s my RA character nº 2. Thanks again for the Guyness calendar Bcc. I had a great time visiting your blog all these months . Happy New Year to you and all RA fans! @Tereza: There have been a lot of requests for a Lucas event and I’m sure there will be one in 2012! I like trying new things so it’s unlikely to be another calendar though, LOL! Thanks so much for all you participation and I wish you a very Happy New Year! Awww, thanks everyone! What a way to end the year, huh? Just think that this time next year, we will have seen the Hobbit at least 10 times apiece, so THAT should make 2012 a wonderful year to look forward to! Thanks Bccmee for all your hard work! Please don’t stay gone too long! You RA dealer you! @trlibhart: Thanks very much for your amazing screencaps! Wow, how did you know Season 1 Guy was my fave? You must have some of that RA ESP that’s been going around. Happy New Year to youuuuuuuuuuuu! Love the surprise! Happy New Year and enjoy Bccmee! Happy New Year everyone! @Musa/Fabo: Yay you found the surprise! I hope the others have time to come back and see the updated calendar! 🙂 Happy New Year! Yep, I think it might be a browser problem. Gone to try to fix. Also, be sure you’re going to http://fanvideos.net46.net/calendar31/Main.html in case your browser didn’t refresh after I made the correction. @Christianne: Yay, glad you found it! 🙂 Happy New Year! Whish you a New Year full of joy, peace, health and love. All I can say, is that I’m so glad I found you!!! What a great idea: Happy Hobbity Armitage New Year! I like that! @Christianne Bailey: Thank you and a very happy 2012 to you too! I hope the muse strikes me from time to time! I have a germ of an idea for a Valentine’s Day fanvideo already. ♥ That’s only 6 weeks away, wow! I hope time flies between now and the release of The Hobbit. Thanks for all your kind thoughts! Thank you so much Bcc for this wonderful month and all the hard work you have put into it! We have been thoroughly spoiled by all this Guy gorgeousness!! Please don’t stay away too long!! Lovely Lucas would get my vote for your next project, if and when you decide to do another!! We wait with bated breath, my dear!!! Wishing each one of you health and happiness for 2012 – the year of THE HOBBIT and THORIN!!!!!!!! Hooray for the Year of the Hobbit and Thorin! Your photo choices are great trlibhart! Bccmee, the surprise in the calendar is wonderful – I think the noise is from two sources: the second being “ovaries exploding worldwide”. LOL! Happy New Year everyone and I’m looking forward to the fun we’ll all have together (thanks to our revered bccmee!) in 2012. Cheers! @Elaine: LOL re: exploding ovaries! I wish you a very happy and creative New Year too! Thanks so much for this and everything you do, bccmee! Have the best time ever ever ever infinity whatever you’ll be doing for the next week! @jazzbaby1: Thank you very kindly. I wish you a super New Year!! Hi, Bccmee! Well, finding your blog made my 2011 a better year. That’s for sure!! I’d like to thank you for your generosity and to congratulate you on your talent and creativity. I wish you a wonderful 2012! May we have a lot of Thorin! Thanks for all the December fun, B. I haven’t stumbled upon the surprise, and I’ve clicked on all 31 days:( Is there a way of saving this calendar, BTW? If so, how? I’d love to keep it. All the best to you in 2012! A very Happy and Hobbit-y New Year to you! BCC, thank you for giving us many delightful moments (and I ‘arrived’ in November) and giggles as well!!! Wish you all the best in 2012… until Thorin comes!!!! @Luciana: I’m so delighted you were able to join us! Happy New Year!! Sir Guy is a splendid way to leave the old year and bring in the new, LOL! @Ania: It’s so much fun to collaborate on these silly projects. 😀 I wish you a very pleasurable 2012 too! @Meryl: Indeed they do go together quite well. 😉 Happy New Year! Yay! Season 1 Guy! I am as shallow as you B. He just looks so darn good in season 1. I really enjoyed all the days. Thanks for all your (ha ha) sacrifice in cReAting these for us! @jeanniegisborne: I’m glad I’m not entirely alone in my preference, LOL! Yes, such a sacrifice to work with RA characters! 😉 I miss it already but I’ll be back! Happy New Year. Thank you Bccmee for this great calendar and for all your funny work. Happy New Year Bccmee , Happy New Year Richard’s fans and Happy New Year Richard! @RAFrenzy: Woohoo, glad that it finally worked. It didn’t help when I posted the wrong calendar at first, LOL! It has been a fun month. I’ve very much enjoyed the Guy-a-day calendar! The surprise was a nice touch and very appropriate! 🙂 Looking forward to seeing what you have in store for the new year. @chabesquen: So delighted you enjoyed the calendar and its “grand finale,” LOL! A very Happy New Year to you! Happy New Year’s Day! I wish you a cloudless and gentle 2012..
@Delia: Thank you for your kind and thoughtful wish. Happy Year of the Hobbit to you! Happy new year BccMee. Thank you so much for all your entertaining this year. @alfie: If you still haven’t seen the surprise, click on the words “The Days of Guyness” in the Flash calendar to toggle the fireworks on and off. 🙂 Happy New Year! It’s going to be a great 2012, I can feel it! Thanks so much bccmee for all the great works you entertained us with and I’m looking forward to more of your fantastic works with a new favorite of my RA characters, Thorin Oakenshield! In the New Year I wish you: river of love! @Joanna: Thank you very much for your kind sentiment. A very Happy New Year to you too! My new year starts not so happy cause I discovered today that my site -non RA- has disappeared from the server 😦 apparantly all costumers were informed but I cannot recall when. Some of my data is now lost and I was just trying to recreate my site at tripod but it’s going rather slow or maybe thats because I have a free account?.. The support area is rather confusing to me. Happy New Year and thanks for all your participation! Thanks B for your thoughts and tip, 🙂 I looked at the site and while working it said my browser was outdated. So i downloaded IE 9 maybe that was my problem. Now continue at tripod cause I already made a start and I liked the lay-out.